Noodle-bar chain Wagamama is to be sold to a private equity firm in a deal valuing the group at £102.5m. Graphite will retain a 12.3% stake in the business but will sell its majority stake to Lion Capital. 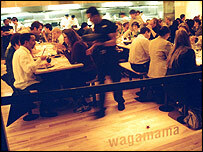 Wagamama said the deal would enable it to fund further expansion plans, particularly in the US. Wagamama opened its first restaurant in London in 1992 and has since expanded in the UK and abroad, profiting from the trend for healthier eating. Lion did not reveal how big a share of the business it will take when the deal is completed next month. "Lion Capital is well recognised for investing in franchise businesses within the consumer-related market," Wagamama chief executive Ian Neill said. "Its expertise in working with companies that are 'brand-oriented' will be invaluable in helping us take Wagamama through the next stage of its expansion plans." A Wagamama spokeswoman said the deal would allow the company to focus on moving into the US market. Last year, Graphite - which bought the original Wagamama sites in 1996 - put its UK flotation plans on hold after approaches from potential suitors. It later agreed a £63m refinancing deal which allowed it to fund its recent expansion. In August, the group will open its fiftieth outlet, based on Japanese-style "ramen" canteens, in London's South Bank. Its UK sites include Manchester, Birmingham and Bristol while its international locations include Australia, Dubai, Belgium and Dublin.